Pinjore Gardens also known as Yadavindra Gardens is located in Pinjore, Panchkula district in the Indian state of Haryana. It is an example of the Mughal Gardens style. The idea and design of the garden was conceived by Nawab Fidai Khan. After Fidai Khan left the place, the garden was subjected to years of neglect and was reduced to a thick and dense forest. The garden was later refurbished by a ruler named Yadvindra Singh, on whose name then the name of the garden was re-christened to Yadvindra gardens. The architecture of the garden has been done in the form of seven terraces which has been given the name of mahals each of its own significance. 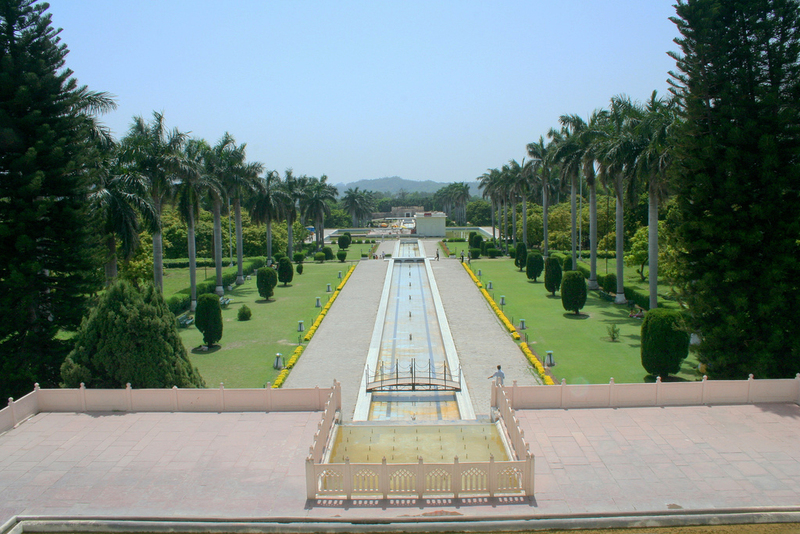 The fascinating Mughal Garden covers a total area of 100 acres. Nawab Fadai Khan, a great architect and foster brother of the Mughal emperor Aurangzeb, planned the Gardens on the classical Charbagh pattern, giving the area a central water way. Both sides of this waterway were covered with patches of green bordered with flowers and shaded by trees. He supervised the construction of the stylistic Sheesh Mahal (palace of glass), the Rang Mahal (painted palace), and the cube-like Jal Mahal (palace of water). Like other Mughal gardens, this one also has a sloping ground and is decorated with fountains and grand and beautiful pavilions. There is a channel of water in the middle of the garden. The fountains are located inside this channel of water. There are walkways located on both sides of the channel. Lined with huge trees and a stretch of green grass, these walkways add to the beauty, charm and elegance of the Pinjore Garden. Walking down straight will lead to a huge pavilion, which offers marvellous view of the entire garden. The pavilion also has a terrace with a water body located in the center. Recently, the end structure of the doorway was made into a disc-like open-air theatre. The stiff outer wall of the garden is suggestive of the fort walls, which has now all around dieter pavilions housing the zoo. A watercourse traipsing from level to level sparkles in the sunlight, its pools reflecting white shining pavilions and balconies etched high against a blue sky. The stylishly arched balconies and shining fountains, luxuriant green lawns and murmuring watercourse, limpid pools, shady walks and colorful flowerbeds, unusual descending terraces and monumental gateways - all are carefully planned to give the magic effect. Besides the greenery and nature, one can find other attractions within Yadavindra Gardens, like a mini zoo, historic places, Japanese garden, nursery, and a number of picnic spots. The gardens are brightly illuminated at night. Special programs are organized in the garden during the festivals, like Baisakhi and Mango Festival, which attract visitors from every corner of the country.